Image Size: 34 X 17 in. In the summer of 1941, the United States is still at peace, although the winds of war are blowing through Europe. 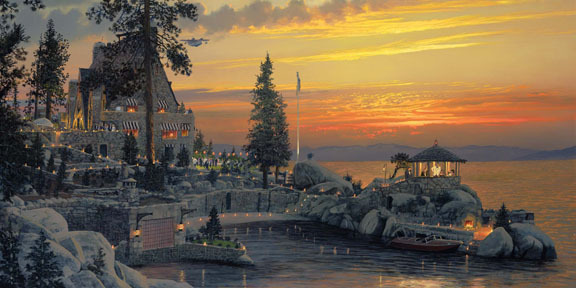 On the warm evening depicted in William S. Phillips' "An Evening to Remember at Thunderbird Lodge, Lake Tahoe", invited guests begin to arrive at the George Whittell Mansion on Lake Tahoe (now known as the Thunderbird Lodge) for a festive evening of cards and conversation. Born in 1881, George Whittell Jr. was fabulously wealthy and was one of the more notorious playboys of his time. His life was fast-paced and privileged, and his real ambition was to live life to its fullest, enjoying the fruits of his wealth unencumbered by the worries of productivity or work. Determined to exploit his position, he began building a retreat designed by Nevada architect Frederick de Longchamps. By 1936, Whittell controlled nearly one-third of the Tahoe Basin, including twenty-seven miles of shoreline. Ironically, in doing so, Whittell helped to preserve the natural beauty of Lake Tahoe for the public to enjoy for many years to come.